There is currently little attention devoted to sound dimension in contrast to the attention for the visual and other dimensions of place. And there is much we still do not know about acoustic environments: how to properly measure people’s experience; visual interactions; or the role of listening states—analytical listening versus distracted listening, for example. The core of Sound Sight is to offer a detailed overview of personal acoustic environments. 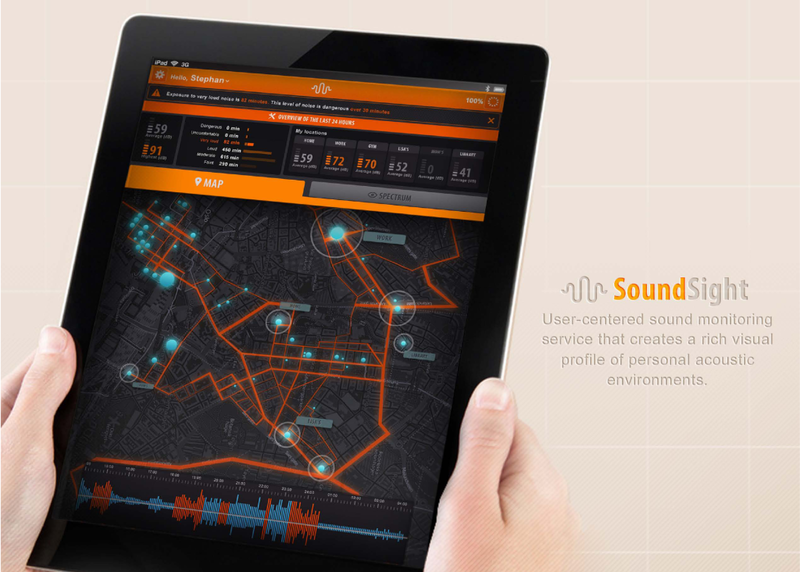 Sound Sight is a location-based service that measures personal sound exposure levels and creates a detailed visual representation of everyday sonic experiences where analysed sound data is communicated to the user through different information visualisations. Sound Sight vant pris for Interaksjonsdesign ved utstillingen AHO WORKS 2012, utdelt av Making Waves.